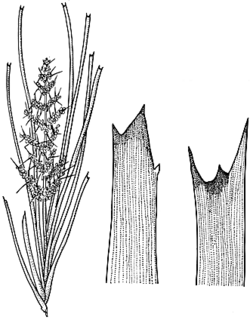 Leaves flat or slightly concavo-convex, occasionally rolled, usually 50–100 cm long, 5–7.5 mm wide, (sometimes c. 2 mm wide) glabrous; apex 2- or 3-toothed, central tooth in pronounced sinus or longer than laterals; sheath margins intact or coarsely split, brown, orange-brown or reddish brown, occasionally white. Male and female inflorescences similar, simple or branched; all branches or when many the larger branches often 2 per node, distichous, from less than 8 c. up to 15 cm long; scape distinct, much shorter to much longer than rachis, flattened; flower clusters whorled. Cluster bracts conspicuous, longer to much longer than flowers, pungent; bract and inner bract shorter than flower, truncate, whitish. Flowers ellipsoidal or cylindrical, sessile; male flowers 3–3.5 mm long, females c. 4.5 mm long. Outer tepals shiny, scarious, purplish or yellow; inner tepals dull, fleshy, yellow or cream. 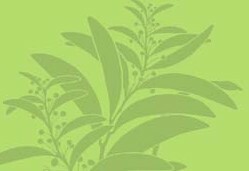 Distribution and occurrence: Grows in a variety of habitats; west to Bobadah. A variable species which, in parts of N.S.W. 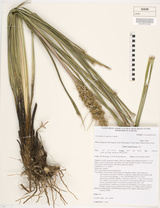 and S Qld, is not clearly distinct from L. confertifolia subsp. pallida. 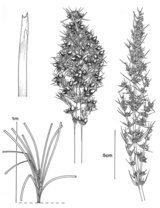 Other taxa closely related and in some cases difficult to distinguish from L. longifolia include L. hystrix, L. fluviatilis, L. spicata and L. montana. 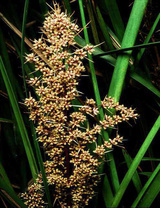 Lomandra is sometimes placed in the family Asparagaceae.